Kansas Gov. 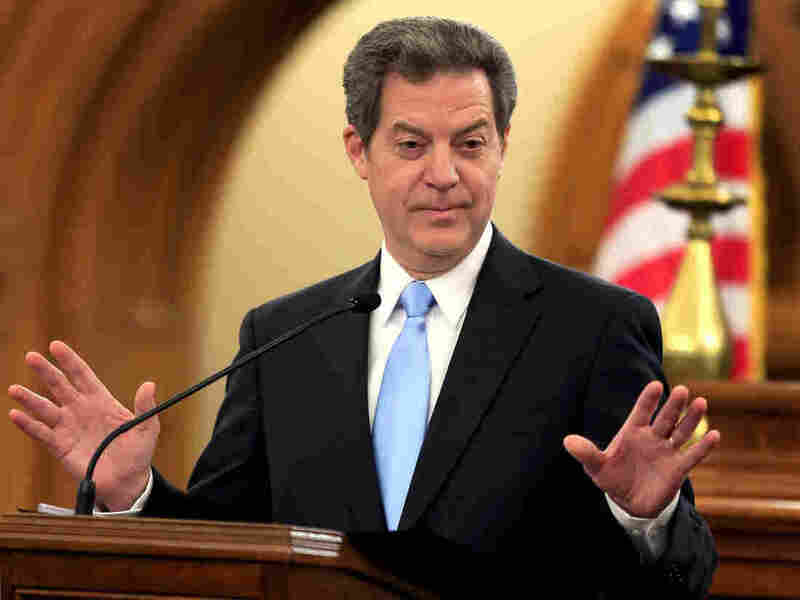 Sam Brownback opposes legislative efforts to expand the state's Medicaid program. Kansas state Sen. Barbara Bollier is a Republican who has been fighting for years to get her colleagues to agree to expand Medicaid. For years she pushed against what she described as a "Tea Party-ish" Senate and a governor who wouldn't consider the issue. In return for her efforts, she was stripped of her committee assignments and sidelined. But in last November's election, the makeup of the Kansas legislature moved decidedly to the center. And last week, the state's Senate joined the House in agreeing to expand eligibility for Medicaid, the government health program for the poor, to about 150,000 more Kansans. "This has been a long time and a hard road," Bollier said in an interview shortly after the vote. The vote had reverberations back in Washington, D.C., because it came just days after Republicans in the U.S. House of Representatives failed in their effort to repeal the Affordable Care Act, also known as Obamacare. That failure breathed new life into efforts in the states expand Medicaid as the law allows. In all, 31 states and the District of Columbia have expanded Medicaid after the Affordable Care Act passed in 2010. The majority acted so that the expansion went into effect in 2014. A handful of states, including Louisiana and Montana, that first rejected the expansion have since embraced it. You could hear the echoes in Topeka last week. State Sen. Ty Masterson, a Republican, urged his colleagues to reject expanding Medicaid because it was part of the Affordable Care Act. He likened the federal health law to a broken amusement park ride. "We're standing at an amusement park ride that's closed. It's broken. And we're saying we want to go ahead and get on the ride," Masterson said. "There is a reason there is nobody in line behind us. Sign's up: 'Out of Order.' I don't want to be first in that line. I want to get out of that line." But Bollier says the Affordable Care Act is here to stay, and that makes taking federal money to expand health care to the poor, which has overwhelming support in the public, a no-brainer. "I've never had anything like that in the legislature," she said. "It was just overwhelming support. Not just support; begging, pleading, 'Please, we desperately need this in place.' "
Bollier is a doctor, the daughter of a doctor and a nurse. She says getting health care to the working poor shouldn't be a partisan issue. "I have yet to meet a patient who comes in and says, 'I'm a Republican,' or 'I'm Democrat, so mete out my care accordingly,' " she said. The law allows states to offer Medicaid coverage to people with incomes up to 138 percent of the federal poverty level, or about $16,400 for a single adult. It also extended eligibility to "able-bodied" adults with no children for the first time. But Kansas Gov. Sam Brownback didn't see it that way. On Thursday, he vetoed the bill. "It fails to serve the truly vulnerable before the able-bodied, lacks work requirements to help able-bodied Kansans escape poverty, and burdens the state budget with unrestrainable entitlement costs," he said in a statement. Brownback said he also opposed it because it allowed government money to go the what he called "the abortion industry." Bollier calls the governor's' arguments "disingenuous." "He keeps claiming we just can't afford this," she says. "You afford what you choose. Where you place your money is a reflection of your value system." Now Bollier and other proponents are working furiously to change just two of their colleagues' minds in hopes of overriding that veto — perhaps as soon as Monday. About 1,200 miles due east from the fight in Topeka is Richmond, Va. When it comes to Medicaid expansion, the two capital cities are mirror images. Virginia Gov. Terry McAuliffe is a Democrat pushing his Republican legislature to expand Medicaid. "I have had more excuses out of our Republican general assembly, none of them correct," McAuliffe tells Shots. "The most recent argument was this was going to be repealed. Well, now it's not. It's not going away." McAuliffe says about 400,000 Virginians could be eligible for Medicaid under an expansion. And the Federal government would send $2.4 billion a year to the state to cover the costs. But the legislature in Richmond isn't buying it. In a statement, Virginia's Republicans said they're still against the proposal. "The House Republican majority remains strongly opposed to implementing ObamaCare's Medicaid expansion in Virginia," the statement said. "Virginia can barely afford our current program, much less an expansion. Every dollar spent on Medicaid is one less that can be spent on education, transportation or public safety." McAuliffe says the barrier is political. Among Virginia Republicans, the specter of U.S. House Majority Leader Eric Cantor unexpectedly losing his primary battle two years ago looms large. "My legislature is terrified of the Tea Party," McAuliffe says. "That's the only reason they're not voting for it. Because they're afraid they'll get taken out in the primary, plain and simple." So in Virginia, expanding Medicaid remains a long shot. But up north, in Augusta, Maine, lawmakers have handed the question to the people after that state's governor vetoed measures passed by the legislature five different times. Tom Saviello is that state's representative for Franklin County, a poor rural district where many people have no health care coverage. Expanding Medicaid would make people healthier, bring in federal money and help the local hospital that's struggling to care for all the people who can't pay, he says. "To me it was a no-brainer, absolutely a no-brainer," says Saviello, a Republican, in an interview. He sponsored bills to expand Medicaid in the past that were vetoed by Republican Gov. Paul LePage. Then on Election Day, a citizens group collected enough signatures — 67,000 — in a single day to put the question to a referendum. Saviello says he withdrew his latest bill in order to let the public decide. "Because we have the citizens' petition, we're putting it in the citizens' hands," he says. Polls show that 60 percent of Mainers want to expand Medicaid, Saviello says. So come November, he predicts: "It's going to happen. It's coming." James McLean from member station KCUR in Kansas City, Mo., contributed to this report. In the audio version of this report, as in an earlier Web version, we mistakenly refer to Wichita as the capital of Kansas. In fact, Topeka is the capital.